Home » Family Fun » Food Safety: How Safe is Your Food? Food Safety: How Safe is Your Food? We all have different ways we handle our food and it’s easy to debate about because, well, we have “done it all our life”. Generations pass down a certain way of doing it and of course, many times we think it is the best way. But is it? Many of us have suffered, or know some one who has suffered from food poisoning. It’s horrible. I don’t know that I would wish food poisoning on my worst enemy. Then again, I don’t really have enemies that I know of so maybe I would if confronted with one. The biggest concern for me is MEAT. I have seen so many ways people thaw meat, cook meat, and consume meat. I have always been a “cook that meat until we know it’s dead” kind of girl. I would prefer to eat tough steak above something that may or may not be loaded with harmful bacteria. However, throughout the years I have become more discerning and want meat that actually tastes good. My best friend in the kitchen is my THERMOMETER. My dad laughs at us but my sister and I always stress when we are at their house and in charge of the meat. “We never grew up with a thermometer and we survived” is one of the things he likes to say. I also distinctly remember eating chicken that wasn’t quite done and burgers that were too pink for me. Along with cooking the meat well, I like to buy in bulk when meat is on sale and freeze it. The only nuisance is that means I have to thaw it, which can be a process if you don’t plan ahead enough. Thawing meat in the refrigerator is by far the best option but if you need to thaw it faster, thaw it in cool water or if desperate and using it immediately, in the microwave. However, the microwave doesn’t leave your meat thawed evenly or with a very good quality from my experience. The problem also comes in if my dinner plans change. Can I re-freeze my meat? 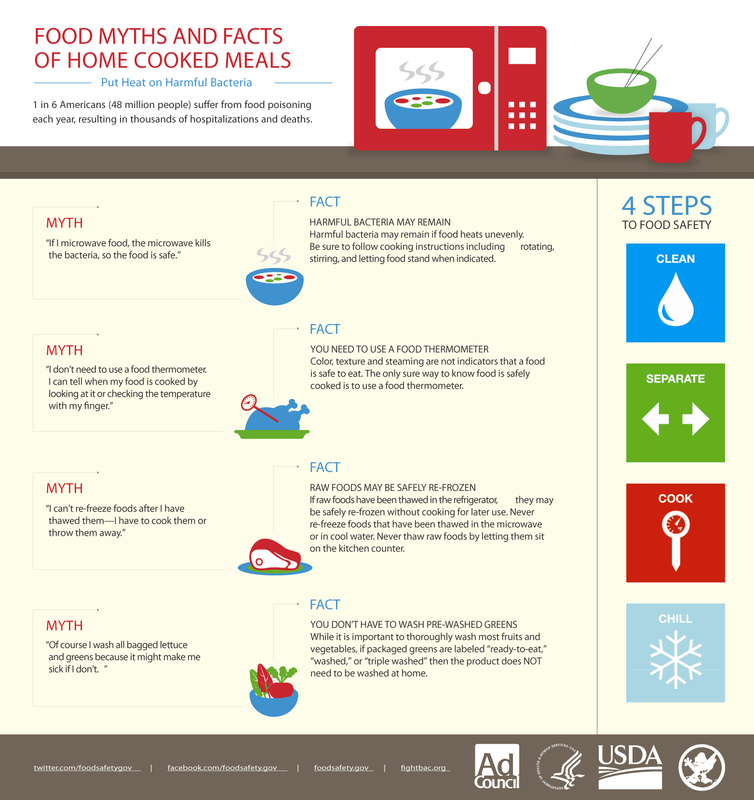 The Ad Council, USDA’s Food Safety and Inspection Service, FDA and CDC, the Food Safe Families Campaign and the Partnership for Food Safety Education are teaming up to share the scoop on some of the biggest food myths so many people believe. « Fitness Journey: Maybe a Runner?